Need a vegetarian dish that is impressive enough for entertaining, but simple to prepare? Just a handful ingredients are needed to create a cozy, delicious meatless monday meal. 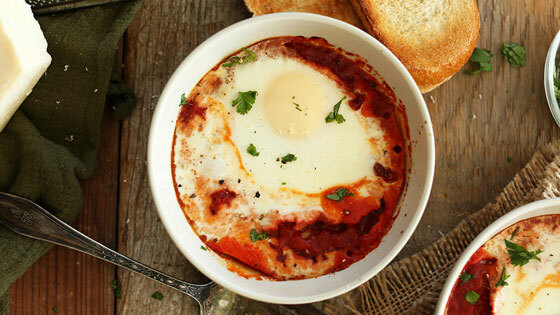 Pair these easy baked eggs with whole grain crusty bread for scooping up all of the delicious sauce and eat for breakfast, lunch or dinner! Preheat oven to 400 degrees F and lightly grease two oven-safe baking dishes. To a saucepan over medium-low heat, add 1 Tbsp olive oil. Then add onions, 1/4 tsp sea salt and cook for 7-8 minutes or until translucent. Turn down heat if getting too brown. Add garlic and cook for another 2-3 minutes. Add paprika and red pepper flake and stir. Then add tomatoes and another 1/4 tsp sea salt and stir. Simmer for 10-12 minutes, reducing heat if it bubbles too vigorously. Taste sauce and adjust seasonings accordingly. Divide the sauce evenly between two shallow baking dishes (Use oven-safe bowls) and top with 1-2 eggs each. Cook for 8-10 minutes or until desired doneness. The whites should be cooked through but the yolk still soft. Top with fresh herbs (and cheese if not dairy-free) and serve with toast. Store any leftover sauce for future use. Recipe curated from Minimalist Baker.